MWS-DP-3 Microwave Solids Flow Sensor - HiTECH Technologies, Inc.
MWS-DP-3 is a microwave based non-contact solids flow sensor. It utilizes the Doppler Effect to detect the movement of solid materials such as powders and granules in pneumatic pipelines. 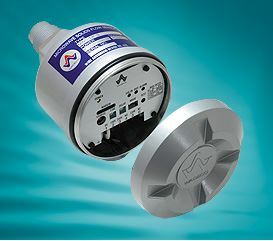 This low cost, reliable sensor is ideal for monitoring the flow of bulk solids in vacuum pipelines, ducts, air slides, gravity chutes, feeders and at transfer points in vibrating chutes, conveyer belts and bucket elevators. Utilizes the Doppler Principle for detecting moving materials.